This January, Venison Editor-in-Chief Amber Imrie and I will be travelling to Elsewhere Studios in Paonia, CO, to complete a two-month collaborative artist residency. While perusing through the Elsewhere Studio website, I came across Lane Taplin’s work and was immediately drawn in by the materiality of her work and even more so by thoughtfulness of it. With a lingering curiosity about her work and experience at Elsewhere I reached out to Lane for further investigation. After graduating from Rhode Island School of Design with a B.F.A. in Textiles, Lane taught art and facilitated community based art projects in programs for adults with developmental disabilities in Portland, OR and Portland, ME. She has created community engaged bodies of work as an Artist in Residence at Elsewhere Studios in Paonia, CO and at Maine College of Art in Portland, ME. When she is not making art she can be found hiking, milking goats, meditating, and fussing over her plants. Lane is currently pursuing a Master's degree in Transpersonal Counseling Psychology: Art Therapy at Naropa University in Boulder, CO. When did you complete your Elsewhere Studio residency? How long were you there for? What did you make while you were there? What was your day-to-day life like? people, and take a break from my projects. I volunteered one morning a week at Small Potatoes Farm, where a wonderful man named Scott welcomed me and taught me all of his farming secrets. I also went to some very lively African dance classes, slow and sensual blues dancing get-togethers, and many uniquely “Paonia” events-- regardless of what day they fell on. For a few months another artist in residence and I hosted “Sunday Sundaes” at Elsewhere, an ice cream sundae potluck and art-sharing time! During my first month at Elsewhere I worked on a series of small sculptures exploring the physical manifestations of emotion that arose for me during meditation. For the previous three years I had been so engaged with my work, teaching art in programs for adults with developmental disabilities, that I hadn’t worked much on my own artwork. So my first month was dedicated to this sort of introspective making. 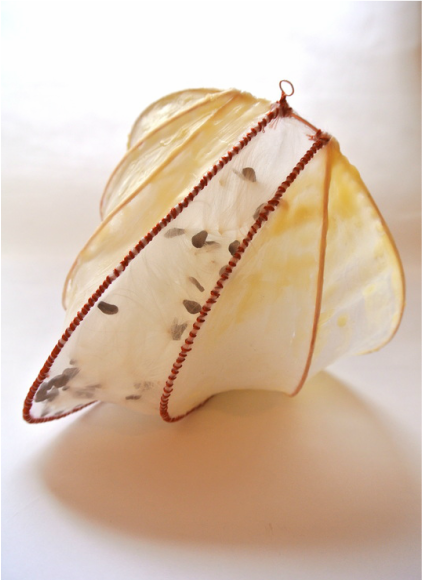 My first sculpture was inspired by the discovery of exploding milkweed seedpods that I stumbled upon on my walk to the Trading Post to get groceries. After my first month I started to really get going with a community-based project that I called “Woven Heart Spots”, which is a visual collection of stories and memories from Paonia translated into woven and silkscreened fabrics. The collection explores the role of stories and memories as they relate to the collective consciousness of a community. Who “owns” stories? How are narratives created around specific locations? What gives a place it’s meaning? Every location holds different narratives for different people. What would happen if every time you pass a particular location you thought not only of your own experiences and associations there but of others’ as well? For instance, what if three people told me their stories about that one tree on the corner of Third and Grand? How does my relationship with that tree change now that it is infused with more stories than just my own? So I went about collecting stories and memories of Paonia from its residents. I had conversations with about fifteen people who represented a variety of lifestyles, beliefs and ages. Some grew up in Paonia in the 40's and 50's, while others have moved to the town within the last year. 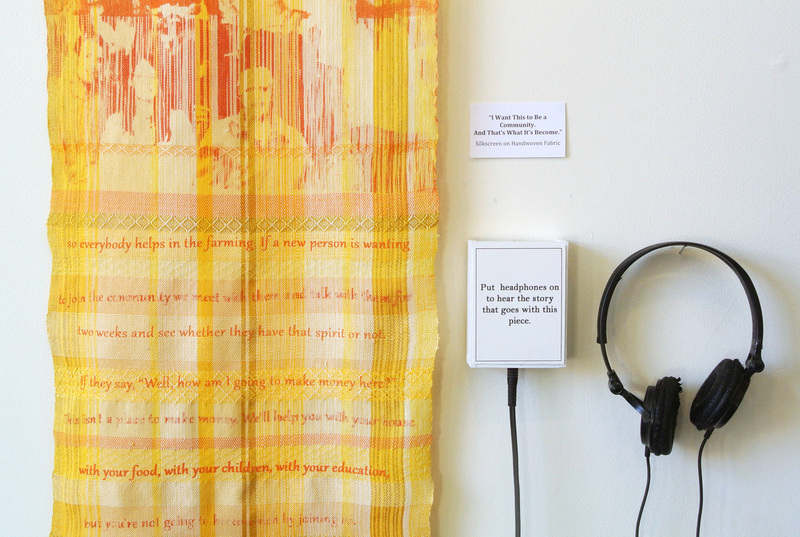 I translated peoples' stories, photos, and written words into silkscreened and woven fabrics that allow the stories to travel from a verbal world to a visual one and from individuals to a community. The pieces were displayed at the Blue Sage Center For The Arts as well as the Paonia Public Library. The shows included an audio tour in which viewers could listen to residents telling their stories while looking at the pieces inspired by them, a storytelling circle, and an interactive "Storytelling Corner" where anyone could write or draw their own stories about Paonia and pin them to a board for others to see. After the shows, the pieces were given back to those who told the stories. After I finished this project, I was invited to stay for an extra month because the resident who was to move into my room next couldn’t make it. Very sad for that person, but exciting for me! I spent my last month at Elsewhere slipcasting peach pits and transferring images of food growing at Small Potatoes farm onto plates and bowls that I would use in an experiential “mindful eating dinner” that I facilitated. Did you know what you wanted to create before you arrived in Paonia? Before I arrived I thought that I would focus primarily on making sculpture and textile-based work and that the woven storytelling project would be a small side project. I thought that I just wanted to have six months of “alone time” with my work, and I did get some of that, but I discovered that what really gets me going is combining my personal textile-based practice with my community-based practice. Woven Heart Spots was the first time that I united these two practices, which before had felt strangely separate. When I got to town I discovered a community development project called the North Fork Heart and Soul. Funded by a grant from the Orton Foundation, the project set out to explore what residents felt was most important for the future of the valley. It seemed serendipitous that this was happening at the same time I was there and I think it is what really inspired me to get serious about the storytelling project. Heart and Soul partially funded my project and the stories that I collected became part of the Heart and Soul archive and research to find out what mattered most to residents of the NFV. How did your expectations meet up with the results of your residency? I couldn’t have possibly dreamed up the magic of my residency at Elsewhere. I expected to be making in solitude, quietly weaving and making sculpture, maybe going for a hike once in a while. Instead I was welcomed whole-heartedly by an inspiring community of creative, strong, and kind people. I was supported in discovering how my personal and community-based creative practices could finally merge. I participated in sheep-shearing, discovered that I love to dance, learned to cross-country ski, planted carrots, canned Elsewhere plumbs, ate the freshest of food, and made meaningful connections and friendships with people who were living more fully than I’d ever imagined was possible. How did your interview process work for your “Woven Heart Spots” series? To advertise the project and find storytellers I put out fliers, talked to everyone I knew, and was interviewed on the radio. I would meet up with people and asked them to bring a photo that represented the story they wanted to share. This was an essential part of the interviewing process because people were more at ease when they had an image to talk about. The focus wasn’t directly on them, but on the image instead. This helped people open up and share pieces of their stories that they didn’t even realize were still there. How did you catalog all the narratives? I recorded the conversations on garage band and then went back and listened to them, transcribed them, thought about them, wrote about them… I also took photos of peoples’ photos. In the end, the stories were presented visually (through images and text), as well as verbally. In your “Woven Heart Spots” project you chose to represent each story is its own piece of woven fabric. Each one stands on its own but how do they interact together? The fabrics all look as if they’re from the same family because all of the stories were filtered through my hands. Each story holds memories of Paonia that are dear to someone’s heart. I think this comes through in each of them and is important because it was my goal to work towards breaking down some of the barriers between people that prevent them from seeing that their stories share the same spirit. Installation shot of "Christmastime When We Were Growing Up"
What challenges do you face with the documentation of your work? The documentation was tough, because what was most meaningful for me in the project wasn’t the pieces that I made but the moments when the stories were shared. How do you document or even explain the way that two lifetime residents of Paonia giggled like little girls and sighed as they remembered swimming in the ditches as children? I feel so honored to have been witness and receiver of these stories. 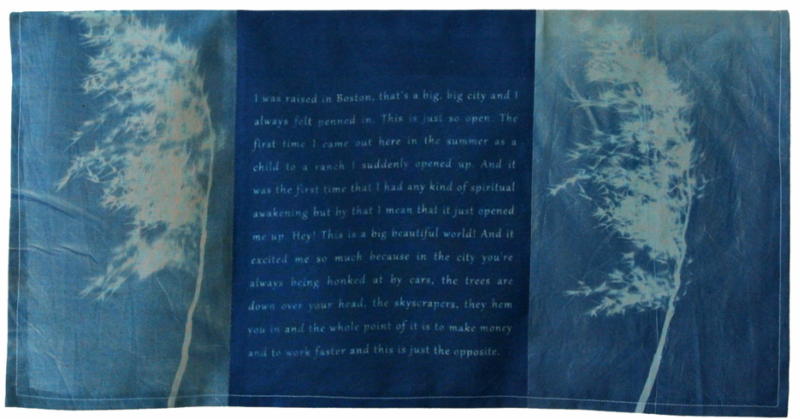 It was a huge gift for people to share them with me, not knowing what would become of them or what it really meant that I was “translating” their stories into woven and silkscreened images. There is great trust and generosity involved in the sharing of stories, and this cannot be documented. Another important part of the work was the storytelling circle. I didn’t see much of a reason to document it because it’s meaning was in the event itself. So in the end there is a lot that just doesn’t get documented, and I’m ok with that. However, when I did document the process beyond photographing the pieces themselves I tried to use methods that would deepen the process and the work. So recording the conversations and interviews was both a method of documentation and a way to add a whole other dimension to the work. When it was displayed people had the option to put on headphones and listen to little snippets of the stories, directly from the storytellers themselves. Do you feel like the audio recordings did the conversations justice? Did they pick up the nuances of each story to your satisfaction? It was really hard to edit the audio recordings because the conversations were just so full of meaning and I didn’t want to let any of it go. But in the end I picked out just a few of the real gems from each conversation, sort of boiling each down to its essence. I think that the audio recordings and the work came together to capture the magic of each story. Was there any one story that stood out to you in particular that you would feel comfortable sharing with Venison, of course? One story that I love was told a woman, Claudia, who has lived in Paonia all of her life. Her parents met there and her dad was associated with a fruit house, outside of which they and their kids would go sledding. Claudia told me this story with much nostalgia as she lovingly gazed an old photo of her parents, posing with a wooden sled. She described how she and her friends were “diehard sledders”-- they would sled on this hill all morning, go home for lunch, and then get right back out there. One day, one of the kids got up a little too much speed and sledded right through the front door of someone’s house! I’ll never forget the sparkle in her eye and her youthful giggle as she described this scene. After the project was displayed you decided to send the pieces back to their owners. What prompted that choice? There was never much of a question for me about this, because the stories weren’t mine. It would have felt like stealing if I had kept the work. Giving the pieces back to their owners was also a way for me to express my gratitude to them for sharing their stories with me and giving me the freedom to translate these stories into visual pieces of art. I think that processes of reflection, such as the way that I reflected back these stories through fabric, are important because they can reawaken meaningful memories, help someone see something in a new light, or maybe even affirm someone’s experience. It is my hope that giving the pieces, the reflections, back to the storytellers deepened and expanded the meaning of their memories. What was your first community facilitated project? What compelled you to go outside of yourself and involve others in your artwork? The very first time that I did community-based artwork was at an after-school arts program in Providence, RI called New Urban Arts, where I was an artist mentor for high school students. This place truly changed the course of my life. It flipped upside down my ideas about the hierarchies and power dynamics involved in teaching and sharing art. NUA is where I learned about collaboration, the freedom to fail, and the power of groups to create meaning. Detail of "Meditations From The Chest"
How does your solo work relate to your community driven projects? A lot of times it doesn’t. I often use my solo work to process personal experiences or emotions. In the end, I don’t really care what happens to these pieces or who sees them because I made them to make them. Their worth comes from the process of making and the relationship that we (myself and the art/materials) develop along the way. The community driven projects are much more about sharing, interacting, and building relationships among people. So there are those two categories: my solo work and my community based work. And then there is this new, glorious category that I discovered at Elsewhere, in which the two merge. The Woven Heart Spots project was the first time that I had ever brought my solo and community work together. 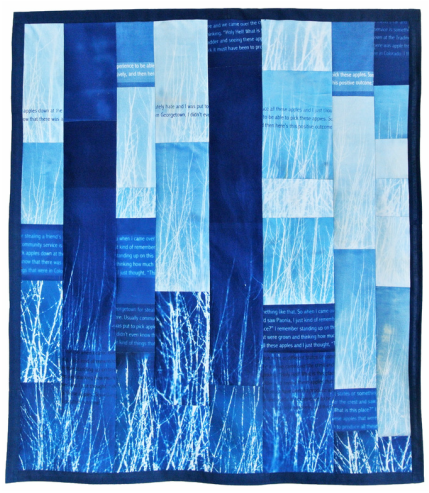 I used the processes that I am in love with (weaving, silkscreening, cyanotype printing, sewing) to help translate others’ stories into visual pieces of art. But sometimes it was a strange thing… I had a lot of questions about ownership of the artwork and of the stories as they took on new life. Who was I to be making work using others’ stories? Throughout the process I was very aware of my role and the sensitivity that was needed in order to work collaboratively. Can you speak about your experience with art as a means of healing? What transformations have you witnessed or helped facilitate? This is a pretty big question for me and a very relevant one because I am currently in graduate school for art therapy. I’ve always used art as a healing tool, whether it is just to calm me down through a repetitive process such as weaving, or to process difficult emotions and events. Since I began doing community-based artwork I have discovered how art can be used to facilitate healing in groups. As an artist mentor at NUA, and an art teacher in programs for adults with developmental disabilities I watched art bring people to a space where they could become vulnerable with each other, see each other and themselves clearly, and therefore form healing relationships. I love doing group projects where people rely on each other and can celebrate each other’s strengths. People discover qualities that they never knew they had, or maybe that they never really believed in. Art is inherently healing for many reasons. It allows people to enter into sustained engagement with difficult feelings that they otherwise might not have been able to be with. Staying with these feelings can allow them to move, transform, and grow. I think that making art softens people; it reveals us to ourselves. Your community-based work is centered around text and bringing stories and narratives into a visual realm. Is writing an important part of your own process? No, I don’t consider myself to be a writer and I don’t typically work with text in my solo artwork. Sometimes I feel like spoken and written language is my second language. Art is my first language. Your solo work is more enigmatic. That is, you seem to be less forthcoming with backstory and process (or at least your documentation is). Why is that? Because I make this work only for myself I skimp a little bit on the documentation and explanation. It can be nice to share this work with others, but ultimately it doesn’t feel that important to do. Sometimes the nature of the work is very tender. There are things that I can express in my artwork that I can’t express through words, conversation, or writing. Taking it into these realms can sometimes move the meaning of the work out of a sacred holding space. For this reason, there are times when I want my experience to remain in a non-verbal realm. I first realized this after being on a week-long silent meditation retreat in which many people had profound experiences. One of my meditation teachers advised the group to be very intentional about the ways in which we share these experiences after the retreat. Sometimes it is important that the experience be held in a very particular way and if it becomes a story told over and over again it can lose meaning and power. Sometimes this storytelling is an important tool, but sometimes it strips our experiences down to their bare bones when we want them to remain full-bodied. What advice would you give to Amber and I before we depart for Paonia, and for any other future residents of Elsewhere Studios? WOAH! HAVE FUN!!!! Go jump on Drew’s trampoline. Let him take you paragliding. But wear a helmet. Eat everyone’s canned fruit from last summer. Don’t be alarmed when you find who-knows-who wandering through the doors of elsewhere without knocking. Spend some time up on the mesas. Find as many ways to engage with this incredible community as possible. Oh- and go get food at the Trading Post! I think on Mondays they have a community lunch by donation. Say YES to everything including your art!